The RM console is one of my preferred debugging tools when it comes to RPG Maker scripting. You can print anything during the game to the console. Combined with scripts or script calls, you can use it to verify that everything is as you expect quickly without writing the data to a file, or using a bunch of msgbox calls. In RPG Maker VX Ace, the console can be attached by passing command-line arguments to the exe. This approach enables you to show the console even if you’re not in playtest mode. Now, previous engines (such as VX and XP) do not support the console natively. 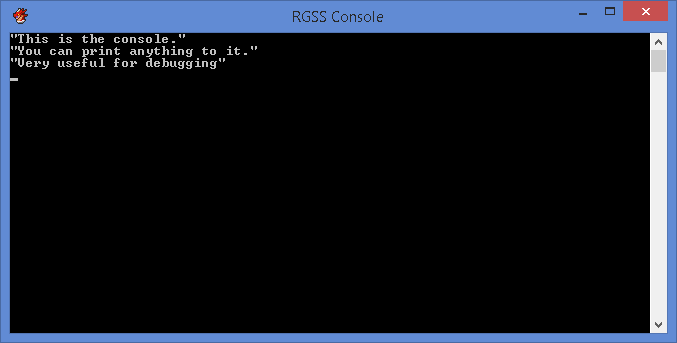 Fortunately, you can create a console and then attach it to the game using scripts. Here is one such script: download here. Just add it to your project and you should see a console window. This also works for Ace, but since the editor already has it built in it isn’t as necessary.